Read about our grant winners and be inspired to propose your own trip. Apply here. 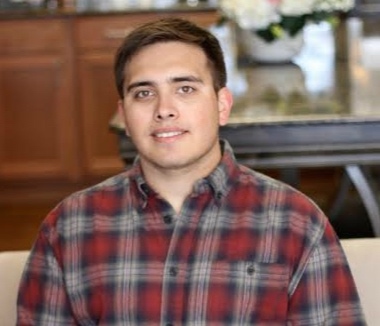 This summer, the Nagypapa Foundation will be supporting Kenneth Estrada as he travels to Dushanbe, Tajikistan for 6 weeks to explore an international dynamic of teaching and learning. Kenneth is currently a student at The College of New Jersey (TCNJ), and already has 7 years of experience teaching English as a second language. He will continue in this field while overseas through America’s Unofficial Ambassadors (AUA) summer service internship sponsored by Creative Learning, where he will teach English to non-native speakers of various ages at the Bactria Cultural Centre. I am originally from Arizona, though I spent a significant period of my life in Nebraska, Virginia and Oklahoma as well. I currently attend the University of Central Oklahoma as an East Asian History major where I have been for three years, and am taking this opportunity to gain a better understanding of the area I am studying, and taking the language to assist me in my research by expanding the number of sources I am able to use. From this starting point I plan to continue on to a Masters program, and from there to become a teacher or professor. I will be traveling to Busan, South Korea for 5 months to study the Korean language and culture at Silla University’s Korean Language Institute. The KLI promises many opportunities for cultural immersion, particularly dealing with traditional heritage and local history. In this way I am able to interact with the people who know their culture best and am able to understand it in a way that a classroom simply would not be able to provide. In the future I hope to be able to teach others what I have learned and encourage them to take their own trips, and be able to provide a more complete education than one would be able to without the experience I am being provided with. Rafiatu Nawuridam, student at the College of New Jersey, will embark on an immersive working and learning experience in Morocco for two months, from May 29 to July 22. Like other Nagypapa grantees, Rafiatu’s voyage is facilitated by America’s Unofficial Ambassadors (AUA) program. She will travel to Ifrane, where she will teach English, help operate a children’s summer camp, and live at the Al Akhawayn University. Rafiatu discovered the Nagypapa Foundation that is funding her adventure through Kathleen Gillen, the AUA program coordinator. Although the young globetrotter is eager to positively impact the kids she will be working with and community as a whole, she says her motivation for travelling to the North African Kingdom is, “to familiarize myself with the Moroccan dialect of the Arabic language as well as expose myself to a different part of the world by exploring a different language.” Rafiatu would like to learn Darija, Moroccan Arabic that is quite different from Modern Standard Arabic, which she already has a background in. “Travelling will definitely expand my horizon and allow me to experience the world from my perspective, rather than through what other people say,” says Rafiatu as she prepares to leave later this month. The Nagypapa Foundation strives to give everyone an opportunity to achieve their education goals through experiential travel and learning. Coming this September, for an entire semester, Casey Pierce, will be another recipient of a Nagypapa grant that crosses over seas to experience a trip of a lifetime. She just recently graduated from the University of Oklahoma with a Bachelors in Actuarial Science and minors in Spanish, Mathematics, and Finance with an insurance and risk management emphasis. This fall, Casey will be taking language and cultural courses at La Universidad de Almería in Almería, Spain. Her goal is to immerse herself into the Spanish culture and language in order to assist many Spanish speakers back home in need of insurance. "Everyone needs insurance," she says. "I want to help people understand their options and their rights so that they feel protected and supported instead of having this mindset that people are being taken advantage of. Most of the time, people don't fully understand their coverages and the process it takes for claims. I want there to be no language barrier, just good communication and support." She plans to study the Spanish insurance business and take back insight on different methods of assurance and hopefully open up a business on her own from these discernments. Casey also has a heart for clean water initiatives and environmentally friendly lifestyles. She quoted, "In America, we definitely take a lot of things for granted. We need to start living for the benefit of ourselves, our co-inhabiters , and the beautiful earth that sustains all of our lives." She plans to travel to many other surrounding countries on this semester trip and journal about how others reduce, reuse, and recycle. Casey hopes to get involved on the campus at La Universidad de Almería and increase awareness and support of ecologically and environmentally friendly lifestyles. She hopes to learn how to grow different crops and plants that are common in their terrain. As well as, take back recipes to cook healthier and more nutritious foods. Casey also is awestruck by architecture and the development of many modern day structures. She plans to visit many historical sights and museums and note how they came to be and what influenced their aesthetics the most. "There's always something to learn from history," she said. "We should be evolving into the best world we can be, and history helps guide our way. When history starts repeating itself in a negative way, there definitely is a need for change. The Spanish have dealt with many historical events that have left the country divided and forced to believe and practice a certain way. Learning more about these events and differences that have produced different cultures and religions that still currently influence many people today is going to be a pretty exciting and enlightening experience. I can't wait to embark on this journey." It's hard to really understand a bigger picture without seeing it first. Casey knows that part of life lessons are about experience and seeing things for yourself. This is a once in a lifetime trip for her and she couldn't be more thankful of Nagypapa and their initiative to help others see the world as it truly is. "My world traveling has just begun," she says. "Nagypapa is helping me make my first step, now I just need to keep climbing."